Pulsus group invites you to attend the “3rd International Conference Advanced Dentistry and Dental Practice” series to be held on January 28-29, 2019 in Bangkok, Thailand. The conference includes keynote talks, Oral Presentations, Poster presentations and Exhibitions providing insights on the importance and efficiency of Dentistry in Healthcare by focusing on the theme "Emerging Interventions in Advanced Dentistry and Dental Practice". 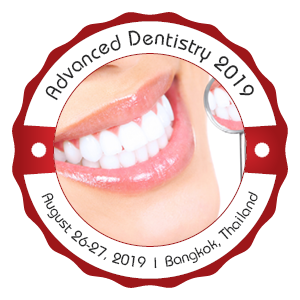 Advanced Dentistry 2019 is an event intended to provide an exclusive platform for new researchers, scholars, dentists, surgeons, dental students and educators to showcase their novel ideas and discuss the most recent innovations, trends and key concerns adopted in the field of Dentistry. The two days of the conference program will include keynote presentations, oral presentations, and poster presenters on the advanced techniques as well as papers in all the fields of dentistry in health care. Advanced Dentistry 2019 aims at exploring advances in dental practice, management and education in relation to health disparities as well as a breadth of other topics. Advanced Dentistry 2019 will provide an opportunity for dental practitioners and educators to exchange research evidence, models of best practice and innovative ideas. It is a platform for dental students, faculty, deans, researchers, and leaders to collaborate on topics affecting dental education. Pulsus Group is an internationally renowned peer-review publisher in scientific, technical, and medical journals established in the year 1984 with offices in Ontario, Canada and Hyderabad, India publishes and hosts the work of researchers in a manner that exemplifies the highest standards in research integrity. With a legacy of 30 years of excellence in Medical Publishing, Now, we are running several International Conferences in the fields of Medical, Clinical, Life Science and, Pharma. Advanced Dentistry 2019 is an excellent platform for Research Scholars, Students, New Researchers, Tutors, dental Surgeons, Dentists, Technicians, Medical Entrepreneurs to bring out their novel Concepts, latest Innovations and concerns in the field of Dentistry and to exchange their Ideology and Researches in the field of Dentistry. Advanced Dentistry 2019 aims to bring together leading Academic Scientists, Researchers and Research Scholars to exchange and share their experiences and research results on all aspects of Dentistry. It also provides a premier Interdisciplinary platform for Researchers, Practitioners and educators to present and discuss the most recent innovations, trends, and concerns, as well as practical challenges, encountered, and solutions adopted in the fields of Dental Education. All submitted Conference papers will be Peer reviewed by competent reviewers. The post-conference proceedings will be Abstracted and Indexed in the International Journal of Dentistry. The conference Abstracts and proceedings book and Certificate of Presentation will be distributed to Participants at the Conference Registration desk. The branch of medicine that deals with the study, diagnosis, prevention and treatment of diseases and other conditions that affect the teeth and gums, especially the repair and extraction of teeth and the insertion of artificial ones is known as Dentistry. The field of dentistry or dental medicine is not limited to teeth it also includes other aspects of the craniofacial complex including the temporomandibular joint and other supporting, muscular, lymphatic, vascular, nervous and anatomical structures. The branch of dentistry which deals with dental pulp and tissues surrounding the roots of a tooth Endodontics. The endodontic procedures comprise of root canal treatment, endodontic surgery and special procedures to save teeth after traumatic dental injuries. Endodontists are experts at managing a wide array of complex endodontic problems professionally. Advanced technologies and specialized techniques used by endodontists provide them a very accurate opinion of the inside of the tooth and allow them to treat the tooth quickly and comfortably. Orthodontics is a branch of dentistry which treats malocclusion, a condition in which the teeth are not correctly placed when the mouth is closed. The Orthodontic treatment is a way of straightening or moving teeth, to improve the appearance of the teeth and how they work. It can help look after the long-term health of your teeth, jaw joints and gums by spreading the biting pressure over all your teeth. Nursing can be called as a noble profession in health care field to give attentive care to the patient, families and even public they recover and maintain health. A Dental nurse supports the dentist, dental technician, dental specialist, and patients in the dental practices. A Dental nurse may have to do check-ups, mental and physical support, setting the equipment, decontaminating equipment’s, medicine instructions, working close to the dentist, preparation of diagnosis setup, precheck the apparatus and monitoring patient. Prosthodontics is the dental field primarily concerned with the restoration and replacement of lost or damaged teeth. Sometimes called the “architects of the smile,” prosthodontists are extremely trained experts with a unique understanding of all the elements that go into a beautiful, functional and natural-looking smile—not just the teeth, but also the gums line, lips, and facial features. When it comes to preparation and carrying out a full-scale smile makeover, a team of dental specialists is often required; many times, that team is captained by a prosthodontist. Periodontics is the field which focuses completely on the inflammatory disease that destroys the gums and other supporting structures round the teeth. The secondary tissues are known as the periodontium, which includes the gums, cementum alveolar bone, and the periodontal ligament. Periodontists treat cases starting from mild gingivitis to more severe periodontitis, such as scaling and root, root surface debridement and regenerative procedures. When essential, periodontists can also perform surgical procedures for patients with severe gum disease. Problems like gum disease, bad breath, yellow teeth can occur due to bad oral hygiene, but they can also be prevented very easily by brushing twice a day, flossing daily, eating properly and regular dental check-ups. The fundamentals of good dental hygiene are taught from a very early age. Similarly, information on common dental problems and their causes is also very important as they can a go a long way in prevention. Dental treatments are necessary for everyone, including children, should visit the dentist for dental check-up at least once every six months. Scaling and cleaning include the removal of built-up debris from the teeth while Sealants protect teeth from decay. Any tooth that has deep channels or gaps can be treated, but the most commonly treated teeth are the molars and premolars. Computer-aided design and computer-aided manufacturing is one of the modern dental treatment methods which is used to recover the design and creation of dental restorations especially dental prostheses, including crowns, crown lays, veneers, fixed bridges, inlays and inlays, dental implant restorations, dentures and orthodontic appliances. It is a surgical field that deals with the treatment of acquired deformities of the head, face, skull, neck, jaws and related structures. Defects typically treated by craniofacial surgeons include craniosynostosis, rare craniofacial clefts, acute and chronic sequalae of facial fractures, cleft lip and palate, Treachery Collins Syndrome, micrognathia, Apert's Syndrome, Craniofacial microsomia, Crouzon's Syndrome, microtia and other congenital ear anomalies, and many others. Surgery of the teeth and jaw bones to artificially change the dentition is called the dental surgery. But, dental medicine isn’t only about fixing your teeth but also covers other aspects of craniofacial complex, such as the temporomandibular structure and other supporting structures. The dental surgery procedures don’t only cover root canals and removal of wisdom teeth that are impacted. The term "Restorative Dentistry" is the combined management of oral health problems and restoring of the mouth to a functional and Esthetic state. Many of the procedures are also covered by the dental specialty of prosthodontic dentistry, including fillings, crowns, veneers, bridges, full and partial dentures and dental implants. The proper handling, inspection and evaluation of dental evidence which will be then presented in the interest of justice is termed as Forensic dentistry. The evidence that may be resulting from teeth is the age and identification of the person to whom the teeth belong. This is done using dental records including radiographs, post-mortem and ante-mortem photographs and DNA. The delivery of dental care to older adults involving the diagnosis, prevention, and treatment of problems associated with usual aging and age-related problems as part of an interdisciplinary team with other health care specialists is known as Geriatric dentistry which is also referred as medical gerontology. Unusual eating habits and poor oral hygiene dental problem in children is very common now a days. Pediatric dentists deal with dental health of children; to care child’s teeth, gums and mouth through the various stages of childhood. To provide treatment, a pediatric dentist must recognize the specific dental and behavioral needs of a pediatric patient as they hold different dentition than adults. A dental visit is necessary within every six months after the first tooth, this prevents the early stages of tooth decay. Oral and maxillofacial surgery includes surgery, diagnosis and treatment of defects, injuries and diseases mainly in the oral hard and soft tissues, neck, head, face and maxillofacial area i.e. jaws and face. Purposes of an oral and maxillofacial surgeon may include dental replacements, jaw, oral and facial tumor diagnosis and removal, jaw and facial bone alignment, jaw reconstruction, etc. Advancements in the field of radiology is changing so quickly that practitioners like oral and maxillofacial radiologists are pioneers in a constantly evolving field of practice. The field of dentistry is also a part of the digital revolution which is transforming every aspect the world and impacting and medicine in a multitude of ways. Specialists say that technological innovation will ultimately improve and broaden access to dental care, allowing for same-day care which translates to fewer office visits—making a healthy smile more reasonable. Advanced Dentistry 2019 welcomes you to join the 3rd International Conference Advanced Dentistry and Dental Practice. The theme of the conference is “Emerging Interventions in Advanced Dentistry and Dental Practice” it will provide a global platform for discussion of present and future challenges in oral health, dental education and expertise meeting. World-leading health specialists, clinicians, educators and researchers will present cutting-edge and practical clinical techniques based upon widely accepted evidence and will introduce new and emerging research. Patient demand for better dental care facilities has increased due to increasing dental awareness and rising disposable income of the people around the world. Furthermore, factors like rising geriatric population, fluctuating lifestyles, increasing incidences of dental caries and other periodontal diseases, rising demand for cosmetic dentistry, and increased public and isolated healthcare expenditure are persistently driving the dental market. So, come and join leading experts from all around the globe in Bangkok, Thailand from January 28-29, 2019 to keep up with the rapidly accelerating step of change that is already having an influence on the field of dentistry. Worldwide, 60–90% of school kids and nearly 100% of adults have dental problems. The cavities can be prevented by maintaining a constant low level of fluoride intake. Severe gum disease, which may result in tooth loss, is found in 15–20% of middle-aged (35-44 years) adults. 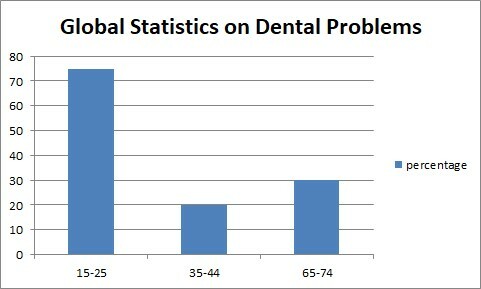 Globally, about 30% of people aged 65–74 don’t have natural teeth. Dental disease in children and adults is higher among poor and disadvantaged population community. Risk factors for oral diseases include an unhealthy diet, use of tobacco, harmful alcohol use and poor oral hygiene, and social factors. Thailand is Situated in Southeast Asia, it covers a total area of approximately 513,000 square kilometers which is the 12th largest country in Asia. Dental tourism is very popular in Thailand. The country has excellent health care facilities, which remain very reasonable. Specialist dental services can be had for very low prices. The savings range from 40% to 80% compared to back home. This makes it very attractive for explorers who want to save money, while still enjoying an amazing holiday. Low cost nevertheless, another advantage of traveling to Thailand the dental work is that you can have just about everything is done there, from cleanings and scaling, to fillings and root canals, to invasive procedures like implants and bridges. Ever beauty-obsessed, Thailand is also a great place to have beautifying dental work done, from porcelain veneers to laser teeth whitening.